UPDATE: It appears that Drop.io’s free fax service was too generous for its own good. Starting July 24th, 2008, Drop.io revised its service and is now only offering users the ability to receive faxes for free. To send a fax, you will have to sign up for a premium account which will run you $10 a year for the least expensive upgrade. It may still be a good option depending on the amount of faxes you’re planning to send; check out faxZERO, eFax, and FaxIt Nice for other online faxing alternatives. I know what you’re thinking; a free service always has a catch. Well the catch in drop.io’s case is that you must use a US-only fax number, and the documents you send cannot exceed 20 pages or 100MB in size. To receive a fax, the receiver (you) must email (or print and send) a provided cover page to the sender. The sender must use this cover page to send the fax, then the fax shows up in your drop.io account as a PDF. Clearly there are limitations to drop.io’s free fax service, but I have yet to find an alternative that even comes close to what drop.io offers. Plus, you can always get around the 20 page limit by printing to PDF with two or three pages per sheet if your software allows it. Another route would be to split your document into files of 20 pages or less, yet be forewarned that a specific fax number can only receive a fax from drop.io every six hours. Regardless, drop.io’s free fax service is outstanding in my opinion, and the catch is so trivial that you might actually feel guilty for not paying to use the service. Signing up for a drop.io account was extremely quick and painless; the only requirement was a file(s) to upload and a custom or random name for the drop. 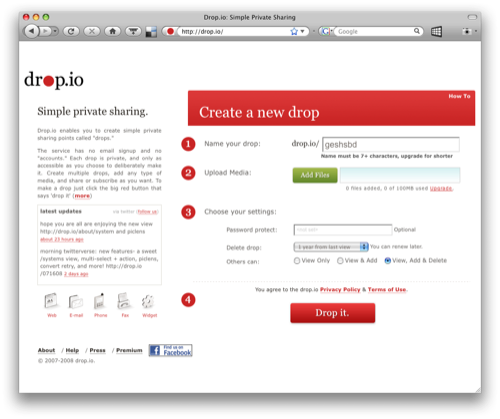 By the way, drop.io refers to their accounts as private sharing points called ‘drops’, but more on that later. In addition, you get to choose the privacy level, an optional password, and a lifespan for your drop; absent is the need for an email address, registration verification process, or any personal info. Once you have uploaded a file to your drop, you choose ‘send’ from the list of available options and then choose fax from the drop down menu on the subsequent page. A status icon appears next to your file to tell you when your fax is in queue and when it has been sent. There’s even an option to print out business cards which include your drop.io voicemail, conference line, and URL. In Conclusion, Drop It Like Its Hot! Seriously, I can go on and on about how useful this collaboration tool is for entrepreneurs and home office warriors on a budget. Not to mention, it’s great for anyone who is trying to setup a paperless office and doesn’t want to feel trapped by not having a fax machine or paid online fax service. My only wish is that drop.io creates a desktop application similar to what Dropbox has done, that way users can just drag & drop files into their drop on their computer without having to use a web interface. Regardless, I would highly recommend checking drop.io out to see if it suits your storage, collaboration, and sharing needs. Anyone else using drop.io? If so, feel free to leave a message in the comments about your experience with the service. Post Scriptum: For those of you who can’t make use of drop.io’s free fax service, check out this post on Groby Unplugged about faxing from your computer. No sendin’ nuthin. Free users can now only receive faxes. @Steven Shaffer – What a bummer! Thanks for giving me the heads up, time to update the blog post. What can you tell me about security for drop.io? How secure are the documents you send or receive? @Diane – I’m assuming that the documents you send and receive are as secure as any other fax since the process is similar. The only difference I can think of is that your documents are stored online in digital form and according to Drop.io’s privacy statement (click here), your documents are as safe as you want them to be. Nice information to send a fax, but there are so many sites offering free online fax service. I wish this information may help you to send fax messages free and secure..
After studying 800pbx.com for half an hour I gave up – in this maze of advertising I couldn’t find how to send fax for free.